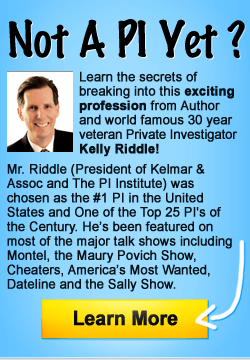 The PI Institute has been operational since 1989 and is a subsidiary of Kelmar & Associates and is currently licensed to meet all state requirements in Texas, Louisiana, South Carolina, Oklahoma and Florida. We are in the process of obtaining certification in other states. You can use the courses if pre-approved by your state board. The PI Institute has trained more than 7,500 professionals since 1989. Whether you are a seasoned investigator or new to the field, you will find our training above average. Take classes on-line in the comfort of your own home or join us for classroom training. Our courses are unique. In most instances, you can utilize a Powerpoint presentation, book or lengthy article, and video seminar (approximately 30 minutes to 1 hour long). At the conclusion of the presentation you simply take a 20-25 question test and upon successful completion, receive your professional certificate of completion and the proper documentation for your state. © 2019 PI Institute. All Rights Reserved.